guy running around the shop would be the guy who turned out this beautiful job. It was Ryan who created this sleek design—pretty impressive for his first major upholstery!" The sleek interior design and sleek execution includes custom raised and shaped floor panels, cus- tom shaped front bucket seats and matching rear bucket seats, with billet accents and a leather high- lighted dash. The fabricated console and package tray is home to a Kenwood audio system, controls for A/C, power windows and door openers, and a custom shifter setup. The console also has storage accessible from the rear; all with matching billet accents throughout. Years ago Johnny Martin began the tradition of cooking a pig and surprising the owner of the latest project with an unveiling party. "The final result surprised even me!" Medina says. "The feeling of cruising in this incredible, stunning work of art that Johnny Martin has turned out has more than exceeded my expectations. 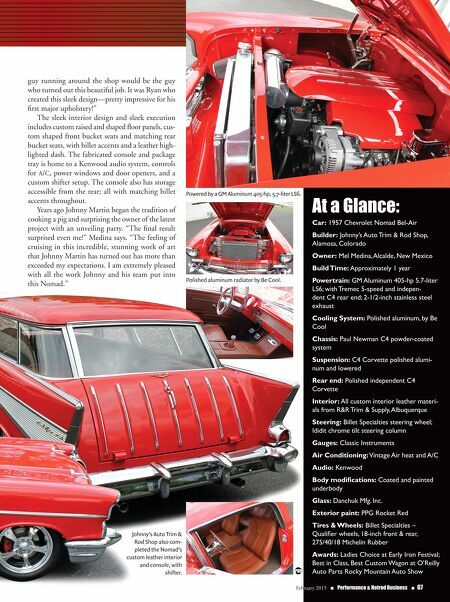 I am extremely pleased with all the work Johnny and his team put into this Nomad." Powered by a GM Aluminum 405-hp, 5.7-liter LS6. At a Glance: Car: 1957 Chevrolet Nomad Bel-Air Builder: Johnny's Auto Trim & Rod Shop, Alamosa, Colorado Owner: Mel Medina, Alcalde, New Mexico Build Time: Approximately 1 year Powertrain: GM Aluminum 405-hp 5.7-liter LS6; with Tremec 5-speed and indepen- dent C4 rear end; 2-1/2-inch stainless steel exhaust Cooling System: Polished aluminum, by Be Cool Chassis: Paul Newman C4 powder-coated system Suspension: C4 Corvette polished alumi- num and lowered Rear end: Polished independent C4 Corvette Interior: All custom interior leather materi- als from R&R Trim & Supply, Albuquerque Steering: Billet Specialties steering wheel; Ididit chrome tilt steering column Gauges: Classic Instruments Air Conditioning: Vintage Air heat and A/C Audio: Kenwood Body modifications: Coated and painted underbody Glass: Danchuk Mfg. Inc. 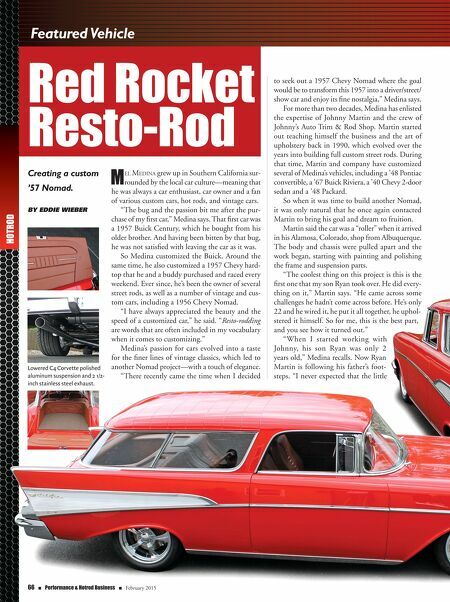 Exterior paint: PPG Rocket Red Tires & Wheels: Billet Specialties – Qualifier wheels, 18-inch front & rear, 275/40/18 Michelin Rubber Awards: Ladies Choice at Early Iron Festival; Best in Class, Best Custom Wagon at O'Reilly Auto Parts Rocky Mountain Auto Show February 2015 n Performance & Hotrod Business n 67 Polished aluminum radiator by Be Cool. Johnny's Auto Trim & Rod Shop also com- pleted the Nomad's custom leather interior and console, with shifter.